Memory Foam vs Latex Mattresses – What to Choose? It seems we want everything when looking for a new mattress. Will it be comfortable enough? Is it durable, good for your health and if that wasn’t enough, is it good value for money? This means manufacturers have a pretty hard crowd to please, but it’s not impossible. As you know, my website is all about memory foam mattresses and this is because I happen to think they’re the best type on the market right now. However I’m not here to make the decision for you. I realized that some people may be considering a latex mattress instead of memory foam, so what better than to add a page telling you the pros and cons of both? This type of mattress has been around for some years now. In fact, they have been available since the mid 1950’s and they are considered to be one of the healthiest mattresses you can buy simply because latex is a natural substance that comes from the rubber tree. Latex mattresses are also incredibly durable. In fact some models will last as many as 15 years or more, and again this is because of the material used. If you prefer a firmer mattress, latex might be the answer because although it will conform to your body’s natural curves, it won’t give you that “sinking” feeling that memory foam does. A mattress that contains (or is made of) latex will generally not give that “off gas” odor when it’s new. Heat is less likely to be an issue with a mattress like this although you may find it produces more heat than a traditional spring mattress. Pure latex is very expensive. In fact, if you want the very best and most natural latex mattress, expect to pay thousands for it. If you’re worried about your carbon footprint, be very careful when choosing a latex mattress. Some manufacturers are not very good at telling you exactly how much has been used. Where a combination of materials is used, expect to find more in the way of synthetics which negates the whole “eco-friendly” reputation. Don’t expect to walk into your local bed store and immediately find a latex mattress. The reason for this is because the material comes from a natural source, it’s not that widely available (another reason why they’re also expensive). If you suffer from severe aches and pains when you sleep, a latex mattress might not be the right choice because they’re not designed with this type of support as a priority. There are a wide range of memory foam mattresses available on the market, and more choice means it’s easier for all types of people to find the right one for them. You don’t have to spend an inordinate amount of money in order to get decent quality because the technology used is widely available thereby making it cheaper. If you prefer a more plush type mattress, memory foam is probably better because they’re designed to cradle your body while you sleep. Some have even been designed with this in mind. For instance, you can take a look at the Ultimate Dreams 13″ Gel Memory Foam Mattress (see here) which is perfect for those nighttime aches and pains. If you’re constantly woken up in the night because your partner is an “active” sleeper, most memory foam mattresses will eliminate this problem because of the way they’re designed. Memory foam will conform to your natural shape much more efficiently than latex which helps to support the major pressure points over your body. 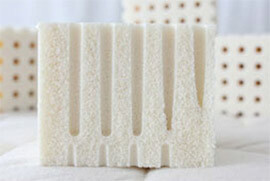 Foam mattresses are constructed from synthetic materials. However, these days’ manufacturers are careful to make sure this is not a danger to your health. Just be sure to look out for the CertiPUR-US certificate. If you tend to feel warm when you sleep, a foam mattress won’t help (although there are models on the market that use various airflow technologies and some even include layers of gel to help keep you cool. The Ultimate Dreams model I mentioned above is a good example of this). Expect to get anything from a slight to fairly strong odor when you first buy a foam mattress. This is because it has to expand into the right shape and certain harmless gases need to escape. A memory foam mattress probably won’t last as long as latex but again, there are models that offer 20 year limited warranties. Hopefully the information above has given you an idea of which type of mattress will suit you better. As you can see both have the pluses and negatives but ultimately, the decision is yours.